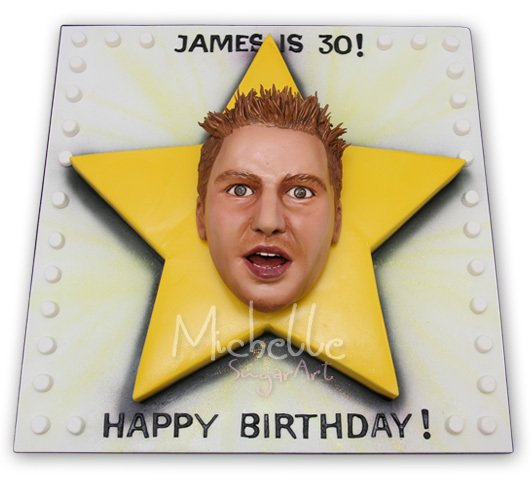 Celebrating James 30th birthday from London, his partner came up with crazy idea, cake in a shape of his face! 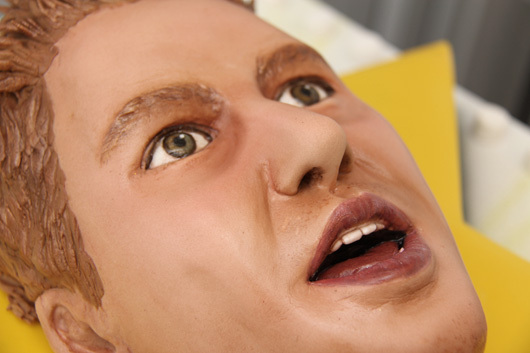 I think we should call this genuine "FaceCake". "I just wanted to say thank you again for your efforts and THE amazing cake! From the start, when we were discussing the cake options, through to designing the cake and delivery of it, you were always so friendly, thoughtful and helpful. I can't tell you how delighted and shocked I was at how incredible the cake was. I know you are talented but the cake far exceeded my expectations. Even before I saw the cake, almost every staff member at the venue (and there were many) were talking about the cake and stopped me to tell me how fabulous it was and that it was the best cake they had ever seen. I agree with them completely. When the cake was presented at the party, it was a complete surprise to everyone. James and all the guests were doubled up in laughter and delight because the design of the cake itself is an inside joke but to see it presented in 3D in cake form really brought the joke to life. The only reason the joke worked so well was because the cake looked so realistic and you captured the facial expression and James' features so well (I can't even begin to imagine how long it would have taken you to create his hair - all those individual spikes!). To top it all off, the cake was delicious! I've come across many cakes where they looked great but compromised on the taste because it was dry. Clearly everyone enjoyed the cake because the whole party was silent for about 5 minutes while everyone scoffed the cake and asked for seconds. I really do appreciate everything you have done. Your meticulous attention to detail in all aspects of your service is something I really admired. I'm looking forward to the next celebration so I can find an excuse to ask you to design another cake! Just fall over the chair...Incredible! Doctor Who Birthday Cake, TARDIS, K9, Dalek. "I would like to take this time to thanks you from the bottom of our hearts on the superhuman effort and skill you put into our cakes. They were show stoppers. Quite literally when the white TARDIS was brought out during the meal service had to be halted for 90 minutes!!! The 40th one we brought out at the beginning of the meal to ensure that we ate! 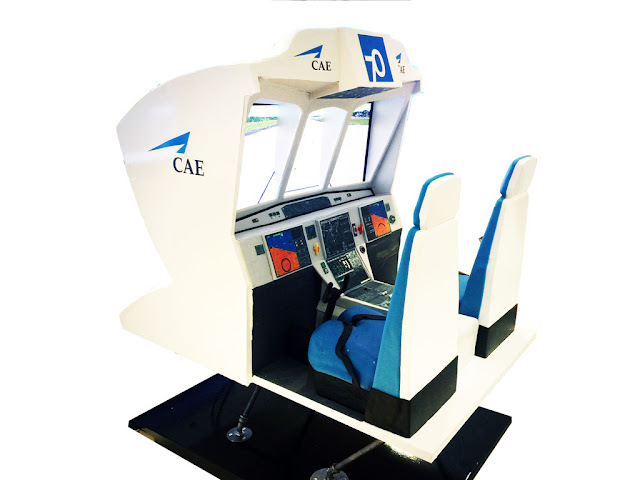 Thanks so VERY VERY much once again"
This year is the 70th Anniversary of CAE, a global flight training company headquartered in Montreal, Canada founded on Saint Patrick’s Day in 1947. Celebrating this special event, one of the leading training centres based in Burgess Hill, West Sussex UK is organising a family event on Saturday, 9th September 2017. All employees and their family were invited for lunch, magic show, have a cake and chance to try impressive flight simulator training facilities. Michelle Wibowo of Michelle Sugar Art was commissioned to create a unique cake for the centrepiece of the event. After trying one of the flight simulators herself, Michelle came up with idea of having the cake in the shape of flight simulator. In order to show of the impressive cockpit, she decided to make a cut out so the cockpit itself become a focal point, complete with led light and working flight simulation screen by hiding an lcd monitor inside the structure. 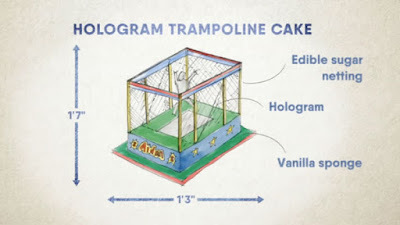 Michelle created 3D hologram cake using iPad and acrylic perspex sheet for 8 years old Aidan who is a trampoline champion. Check out the video below from Season 2 Episode 21 Extreme Cake Makers. 1. Plan your design, here is an example of simple design. 2. Build the base for the iPad and layered of sponge cake around it. tips: you can capture video directly on iPad, or using camera then transfer it to iPad, just make sure use the black background. tips: test your video at this stage.